In August of this year, we informed you in our News Flash about the obligation of mandatory activation of electronic mailboxes for legal entities and registered branches in Slovakia. In this connection we would like to inform you that the transition period was extended to July 2017. Based on the amended Act no. 305/2013 Coll. on the electronic performance of tasks by public authorities that came into force as of 1.7.2015, electronic mailboxes of all legal entities and registered branches in Slovakia should be automatically activated. The process of the activation was supposed to be completed on 1.1.2017. 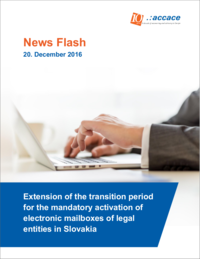 However, the transition period – during which all the electronic mailboxes will be activated – was extended and will terminate on 1.7.2017.
all electronic mailboxes will be automatically activated on 1.7.2017, even those which have been not activated during the transition period by the first (optional) login. To access the electronic mailbox, electronic Slovak ID (with chip) and personal security code (BOK) will be required. You can find more information about the access in our newsletter here. If you don´t have the possibility to ensure the access to the electronic mailbox of your legal entity or registered branch (for example because you do not have Slovak electronic ID in possession), we would be pleased to help you in this area on the basis of the granted authorization. We will monitor your electronic mailbox and inform you about its content and in case of need provide you with other related services.